Nomination Guidelines & FAQs: Wish, Act, Protect! Thank you for your interest in nominating a Hope Spot. While anyone is welcome to nominate a Hope Spot we do hope that you are ready to commit time to working for your Hope Spot and partnering with others in your local community that will help achieve tangible results. All nominations must be supported by the local community in the Hope Spot. There are many ways that can happen and you will be able to direct that progress according to your needs and timetable. Please note that work in the Hope Spot will take place for years to come therefore we request that you are committed long term. Knowing what you need beforehand will allow you to save time and complete the form more easily. We recommend filling out the nomination in the word document provided below and once you feel your nomination is complete, copy and paste that information into the online form. In doing so you will have a backup in case something is lost in the process and you can submit it in one go. There are two types of nominators, an individual who is not representing an NGO or an individual representing an NGO and/or multiple parties. In either case we require that your nomination has community support. Community support will help ensure the success of the Hope Spot and future actions. For an individual who is not representing an NGO we recommend you partner with an NGO or scientific organization who will be able to assist you in filling out the scientific questions in the nomination form and be a scientific partner if the Hope Spot is designated. For an individual representing an NGO, while you don’t need to partner with another organization to submit the nomination, we do require a minimum of 2 letters of support from outside organizations or individuals. Please see information for letters of support below. A list of partners who are supporting this nomination. We recommend at least 2 additional partners other than the nominating party. A minimum of 2 letters of support from outside organizations or individuals. These can be NGO’s, schools, universities, political leaders, community leaders etc. The letters of support should state their intention in supporting this nomination and the actions that will be taken in the future should it be designated as a Hope Spot. Be sure that all fields within the nomination form that are required are filled out. Tip! It’s important that you take the time and effort to fill in the form well, otherwise we are likely to ask you to give additional information or defer the nomination- all of which takes more time and effort from everyone. Two points we find nominators don’t give enough attention to is the importance of having other local partners and giving us enough information about what you want to do here. If you seriously want to make a difference in your Hope Spot, both are essential and the council will consider these points seriously. Here is a word document of the nomination form so you can prepare and have a backup prior to submitting the online nomination. Step 1: Find and establish partners within the community who support this nomination and will also support ongoing work once it is designated as a Hope Spot. Step 2: Fill out the nomination form. Step 3: Once you have filled out the nomination form and submitted required information, it will go under an initial review. We will contact nominees for further information as needed and to discuss next steps. Step 4: Once your nomination has passed the initial review and contains all required information, it will be presented to the Hope Spots Council who will review the nomination and determine whether or not it will be designated as an official Hope Spot. You will be notified by a member of our team either way. Step 5: Once the Hope Spot is officially designated by the Hope Spots Council, we will work with you to launch it publicly on our map, website and media channels. Step 6: You as our Hope Spot Champion and your partners will work on a variety of actions to help achieve results and protection in your Hope Spot. This is ongoing. 1. How does Mission Blue support Hope Spots? 2. What is the advantage of being identified as a Hope Spot? Upon approval as a Hope Spot, Mission Blue celebrates with you or your organization by scheduling a press announcement and assisting in increasing local, national and governmental appreciation. We will also host and share online stories about your Hope Spot on multiple platforms including our beautiful newsletter: Hope Spot Sentinel! The news will have massive social media outreach, locally and globally and so it will be a great opportunity to share your story with the world. This globally recognized platform will become a valuable education and marketing tool- the possibilities are endless and will hopefully lead to legal protection. Additionally, please see question 1 above which details the support Mission Blue offers for our Hope Spots. 3. What will happen to my stories and the information I give you? With your permission, the stories and information you provide to Mission Blue will be shown on our Hope Spots Information Platform so people from around the world can learn about your Hope Spot. We will also use it to contribute to our newsletter the Hope Spot Sentinel and to be shared on our website and social media networks. We are building a movement to ignite support for a global network of marine protected areas. Your submissions will never be sold or used for commercial purposes. 4. How can I learn more about Hope Spots? 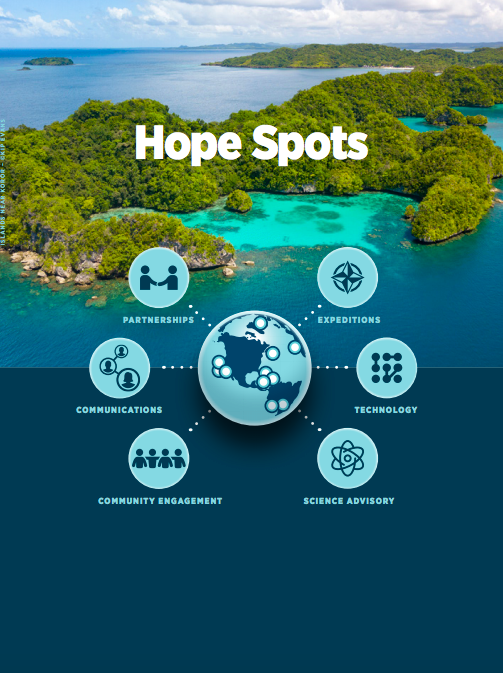 Sign up to the Hope Spot Sentinel newsletter and explore the Mission Blue website for general information about the initiative, as well as maps, videos, photos, descriptions, stories and much more about individual Hope Spots. If Netflix is available in your location, you may view the Emmy Award Winning documentary, for the story behind Dr. Earle and Hope Spots or you can purchase a DVD here. 5. How can I support Hope Spots apart from just nominating one? a) Financial help- make a donation (any amount is important!) to Mission Blue via the website link. c) Volunteering support- Contact a local organization working in your Hope Spot area and offer your time to volunteer for them. It’s free for you, but has a huge impact and the organizations are usually very grateful for any help in the field.